This week, Stephen Ibaraki, FCIPS, I.S.P., ITCP/IP3P, MVP, DF/NPA, CNP, FGITCA has an exclusive interview with Lauren Woodman. Lauren Woodman serves as the General Manager of Education Programs in the Worldwide Public Sector organization of Microsoft Corp. In this role she is responsible for Microsoft's most significant education programs: Partners in Learning, a 15-year, $750 million investment to help educators use technology effectively in teaching and learning; and Shape the Future, a global initiative to close the opportunity divide by enabling technology access for every student. Through these programs, Microsoft has trained more than 11 million teachers and reached more than 230 million students since 2003. Before joining Microsoft in 2002, Woodman served as the executive vice president for the Software & Information Industry Association, the principal trade association for code and content companies. 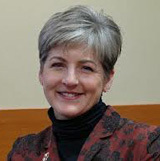 A regular speaker and author on technology policy issues around the world, she served in a similar position with the Software Publishers Association since 1996. Woodman began her career on Capitol Hill with Rep. Jim Cooper (TN) as a legislative assistant handling public policy issues on telecommunications, trade and defense. Woodman holds a M.A. from Johns Hopkins University School of Advanced International Studies and a B.A. from Smith College. :00:30: Can you profile your three top wins prior to joining Microsoft and lessons you wish to share? "....One is some of the work that I did on privacy policies in the late 1990s....The second interesting thing I	did before joining Microsoft was much earlier in my career and that was working in a startup environment....The last thing was very early in my career and I was an intern on Capitol Hill....As the world around us changes, being open to new ideas, keeping your eyes open and learning from the folks around you I think is critically important for continued success...."
:05:12: You mentioned your work as an intern on Capitol Hill. How would you contrast your experiences then to what you see in Washington today? "....It's a very different world mostly because it was 25 years ago. I don't spend a lot of time on Capitol Hill these days so I'm not sure I'm the best person to answer the question in terms what it's like from an insider's perspective....I think we have all seen and understand the difficulties that sometimes plagues Washington these days, but I remain convinced and optimistic that there are folks out there with the right focus in terms of what they are trying to do and the leadership capacity in order to effect some meaningful change...."
:07:00: What is the mandate behind Microsoft Education for 2013 and 2014? "....Our goal is to make sure that learning can happen anywhere and at any time and technology makes that possible. All of the work that we do is really focused on how do we use technology effectively inside the classroom with the focus on student outcomes, and how do we work with professionals around the world who can bring their domain expertise to Microsoft and work in partnership with us so that we can bring our expertise around the technology side so we can improve what's happening in schools around the world...."
:08:18: How would you contrast what you are seeing in the different regions around the world versus for example what’s happening in the US? What does it all mean region by region? "....We've had the privilege of working in many countries around the world and one of our key programs, Partners in Learning, currently runs in about 119 countries and has been for about ten years so we've got a depth of experience that we've been privileged to learn from....What we see in a lot of emerging economies, where perhaps they haven't had that experience of this technology being increasingly ubiquitous, so they've got the opportunity to leapfrog to where many of the developed countries are today. We see these economies thinking about how can they bring one-to-one computing into their classrooms and thinking very deeply about the teacher experience and how to provide the right professional development for educators to understand how to use technology effectively....While I point that out as somewhat of a difference between emerging economies and developed economies that's not always true. Portugal is a very developed economy but several years ago they did this and provided a one-to-one experience for all of their students in their country, thinking very deeply about all of these pieces even though they already had some experiences with the use of technology and they've done very well with it...."
:11:37: As General Manager, what are your success metrics? "....We look at whether or not the assets that we are creating for use with these technology deployments are being well used. You can get a pretty good sense very quickly as to whether or not the professional development that we're providing is actually resonating with the teachers and school leaders that we're working with and we talk, research and measure that feedback from those folks to make sure that we're moving in the right direction. The second thing that we look at is whether the teaching practice is evolving to use technology more effectively and this is somewhat of an ongoing conversation. We are starting to see those metrics really take off, but we also know that as technology changes how we define innovative teaching is also going to change....Microsoft is a large global company and we look at reach and impact just through straight numbers in terms of adoption as one of our key metrics..."
:14:13: You talked about how technology use in schools is good for students and educators and the tie-ins to learning outcomes. Which educators are using it or is it just one segment? Are there examples of where technology has driven improved learning outcomes? :26:39: What great resources is Microsoft providing to impact the classroom? "....Windows 8 supports touch, it supports stylus and of course it works very well with a keyboard....Office 365 allows schools to provide their students a very rich cloud-enabled productivity suite so not only are they getting subject matter expertise, but they also are learning the tools that they are going to need when they move into further study or the workplace....One of the things that is often overlooked and is the most relevant in the education space is the tool called OneNote. OneNote is part of the Office Productivity suite and is a wonderful way for students to organize their notes by class, to embed video and audio and to handwrite notes....The other thing we see as we look at some of the more consumer-oriented platforms that are coming out of Microsoft (the Xbox etc) and think about bringing into the classroom, Kinect in particular is something that we're looking at very closely....The Partner in Learning network, a resource we provide to teachers around the world not only for teacher-generated content and the great things that teachers are doing in the classroom but examples that we find or that our labs have developed...."
:34:38: What regions are represented in terms of languages? In other words is it pure English or are there other languages now within that platform? "....One of the things we wanted to do with Partners in Learning was not make it a US-centric or English-only experience. Partners In Learning now runs in 119 countries and there are resources available in literally dozens of languages on the Partners in Learning network itself which is available to any teacher for free anywhere in the world. We use machine translation to support about 36 languages simultaneously. Machine translation isn't perfect, there are certainly some limitations with it, but it's one of those things where the more folks use it the more they help us improve it not only on the network, but all across the web and the experience gets better....One of our big efforts right now is around Teaching with Technology. Teaching with Technology is some curriculum that we've developed to help teachers meet the UNESCO ICT competency framework for teachers...."
:37:36: You were at the UNESCO Paris summit in February this year. What did you see as the key outcomes? "....As a technology company we were thrilled to see the emphasis on ensuring that broadband access continued to be a focus for governments around the world. We were very happy to see the continued emphasis on education and that every child deserves a right to a quality education....From a broader policy perspective and taking it out of the Microsoft realm and taking a step back and looking at what the UNESCO charter has been and what the charter has been for the World Summit on Information Society since it started almost a decade ago, I think the continued emphasis on the cultural aspects on what needs to happen in the Information Society are really critical...."
:40:33: You speak at a lot of forums — are there other ones that you are going to be speaking at later this year and what do you hope to accomplish? "....This fall we will be doing an event in Mexico where I will be at the Partners in Learning Global Forum. It will be my next big opportunity to talk about the work that we're doing with the Partners in Learning. We chronicle not only the work that we do, but also what the educators around the world do on a site called Daily Edventures that is where some of these ideas get brought to the fore every day. There are so many good ideas out there that we could do this every day, so we set out to see if we could find a good idea every day — it turns out that we have several years worth of good ideas ahead of us...."
"....I think computing is a very lucrative career whether you want to go work for a technology company or if you want to go work in another industry. There are a wide variety of recognized credentials that exist today. In the computing field we see a number of not only company specific but association credentials that are meaningful. Microsoft has its own slew of credentials whether we are talking about folks who are in the IT deployment side or whether they are on the engineering side or the networking side. We've spent quite a bit of time thinking about how we recognize those that have really great computing skills no matter how these get defined and how they get used in their professional lives....I do know that we as a company think about our role not only in the industry but in the business world and frankly in our local communities...."
:51:48: Lauren, with your demanding schedule, we are indeed fortunate to have you come in to do this interview. Thank you for sharing your deep experiences with our audience.